Get A Plan! 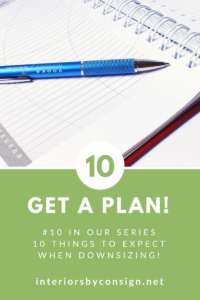 #10 in our series – 10 Things to Expect When Downsizing! If you are reading this – You are ready to begin the process of letting- go! If you are moving, downsizing, or just getting rid of clutter, you need to begin looking at your items with a critical eye to determine what you really want and need. Everyone should embark on this process every few years to simplify our lives! For many people the process of downsizing is daunting, but the reward of powering through can be very satisfying. There is peace in knowing what you have and purging your space of things that are no longer precious or needed. That said, letting go can often be emotional and bring on all kinds of yucky feelings including quilt and grief. I have addressed these issues in previous posts. Read 10 Things to Expect When Downsizing. 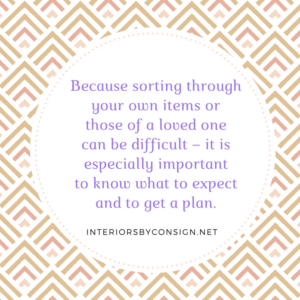 Because sorting through your own items or those of a loved one can be difficult – it is especially important to know what to expect and to get a plan. Here are some suggestions to get you started! If you can help it, don’t wait to get started just days ahead of a deadline. If you can cut this task into manageable pieces, your anxiety level will greatly decrease! Believe me, it will take twice as long as you think, especially if you start without a plan. A tight deadline is recipe for stress but sometimes you just don’t have any other options. Include in your timeline: dates for family and friends to identify items they want, appointments for an appropriate consignment store to make a home visit, dates donation sites offer pick up, determine what day trash pick up is scheduled, etc. If movers are involved, now is the time to get estimates. You will have a better idea of what you have left to move later in the process and can get back to your favorite mover with details at that time. You may also wish to get quotes on cleaning services to come in after you have emptied your space. If you have family members that will be taking items, get them involved! Remember if others are claiming items, it is their responsibility to remove their items on your timeline! Don’t fall into the trap of storing items for a later return! Read more about storage units here… If you don’t have family members to help, ask a friend. If you must work alone, be kind to yourself, this is hard stuff! I recommend you read the other 9 things to consider when downsizing on this blog before you begin. There are tips there that may be helpful. Tag everything you will keep and move with you first. Choose a different color sticky note or index card for things to consign, donate or gift to someone. Write on the card what the plan is for those items. Now is the time to contact us about consigning your items. 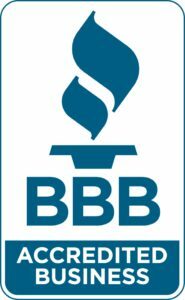 You may contact either the Huntsville store @ 256-880-0909 or the Madison store @ 256-325-4140. We prefer to come after you have determined what you will keep, and your family members have done the same. At this point you can send us photos of what you would like to consign or call us to make an appointment for a consignor visit. We will be happy to tell you what we can sell and what we cannot. This will give you an idea of what will be left to donate or offer to friends. Upload photos on our consign with us tab or email them to either store. After you have sorted all your items you can now purchase containers. It is impossible to know what size or type of container you will need until you determine what items you have left to store. Plastic containers are best for papers, photos and items that need to be kept dry and bug free. If you are planning to store keepsakes beyond your move, it is a good idea to pack them correctly now. While you are sorting anyway, take the time to invest in proper containers to keep your items safe well beyond transit. There is nothing sadder than saving photos and precious items for years only to find them ruined when you are ready to unpack them. Find Containers here Label everything so you don’t have to open a box to know what is inside. Avoid cardboard for items that you will store long term. Cardboard boxes are fine for items you will be unpacking soon at another location. Again – mark the contents of each box clearly on the outside. You can even tag boxes by room or person if that will be helpful on the other end.